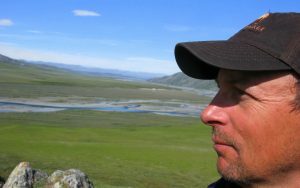 Nils will talk about the migration and conservation of shorebirds around the Pacific Basin, focusing on studies he and collaborators have done over the past 30 years. His initial research focused on the migration of small shorebirds like the Western Sandpiper and the Dunlin through western North America. More recent work looked at large-scale movements of godwits and curlews around the Pacific Basin, from New Zealand, Australia, South America, to the Arctic. Results of these studies will be discussed as well as the conservation challenges shorebirds face in our rapidly changing world. Nils Warnock received a Ph.D. in Ecology (1994) awarded jointly by the University of California, Davis and San Diego State University. He is a Fellow of The American Ornithologists’ Union. After post-docs with the University of Nevada, Reno, Simon Fraser University, and Oregon State University, he has had positions as the Co-director of the Wetlands Ecology Division of PRBO Conservation Science, and for the past eight years, as the Executive Director of Audubon Alaska and a Vice President of the National Audubon Society. His ornithological research spans more than 30 years and has focused on the movement ecology and conservation of shorebirds.